In this video presentation, projekt202 Senior UX Designer Kim Harris discusses best practices for using lean UX, addresses common UX design concerns, and shares the benefits of a collaborative, lean approach to software. A transcript of the presentation also follows. I'm Kim Harris and today I'm going to speak to you about Lean UX. I'm a senior UX designer at projekt202 and my job is to advise clients on improving their enterprise software. I've been fortunate enough to walk into many organizations to do this, but I've noticed that everyone's process is different. Even with the implementation of agile methodologies, I often run into frustrated designers, overworked developers, salespeople trying to ship a product, and business analysts chasing after requirements. If this sounds like your culture or your corporation, then maybe Lean UX is something that you can actually implement. You can actually go on the other extreme and implement a catastrophic change to your culture, but to save you time and money, let's start with something small. The bottom line is, a negative environment fosters failure and generates low morale. What is Lean UX? It's a set of principles that seeks to remove waste from our design process, harmonize our system of resources through cross-functional collaboration and shift our mindsets to building products based on experimentation. It's based on a book called Lean UX by Jeff Gothelf. Lean versus agile: You're most likely familiar with the agile manifesto, which values individuals and interactions, working software, customer collaboration and responding to change. With Lean, we want to make sure that we increase a team's ownership over the work by providing an opportunity for everyone's opinions to be heard much earlier in the process. Let's talk about a sample Lean team. Let's start with a cross-functional team made up of a business analyst, sales, project manager, designer and a developer. We want to make sure that they are cross-discipline, because we want to make sure that everyone's opinions get heard from the start of the project. Essentially, these people should be together from day one so that they all hear the same conversations throughout the duration of the project. Next, we want to make sure that they are small, dedicated and co-located, so that we can foster camaraderie and collaboration, and that they are able to focus on the primary task at-hand. Third, they externalize their work. Any ideas that they have, they actually get out on whiteboards, on artifact walls, on Post-it notes so that ideas can be continued to be built upon. Sometimes, the person who may not have the loudest idea or the loudest voice often puts an idea on a Post-it note that actually may be the best solution for this offer that they are working on. They also value making over-analysis. They turn their ideas quickly into prototypes instead of analyzing what could be or what should be. This allows them to get customer feedback faster, so they can go back and reiterate, and make better decisions. They are also continuously discovering, so they can get customer feedback sooner rather than later, so they can continue making improvements on the software that they are working on. Lastly, they minimize deliverables. They don't spend lots of time on documenting, because everyone on the team has been there since day one, so they've had lots of the same conversations. They actually are able to spend more time building software, because, essentially, software is what customers will be using. What have we learned so far? Lean UX not only brings software designers to the table, but it also brings our partners in business and technology to work with us so that we can continue to create the best solutions in an ongoing way. 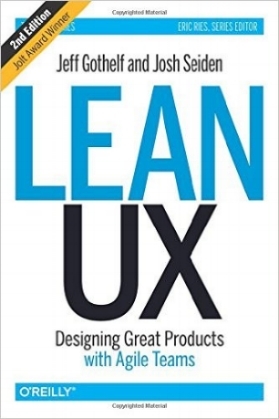 You can either read the book Lean UX if you're interested in implementing this, or you can come to projekt202 and work with us.